We report an interesting case of a male toddler with global developmental delay, dysmorphic facies, seizures, and acyanotic heart disease. 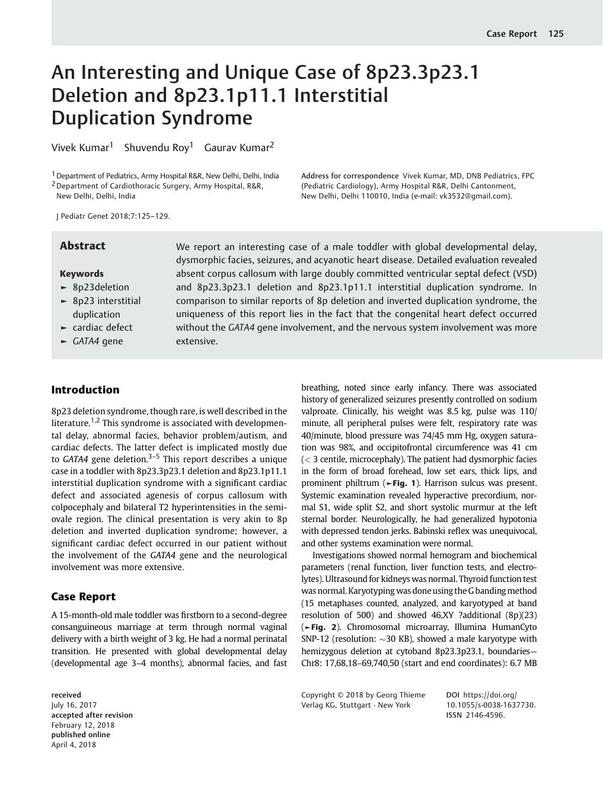 Detailed evaluation revealed absent corpus callosum with large doubly committed ventricular septal defect (VSD) and 8p23.3p23.1 deletion and 8p23.1p11.1 interstitial duplication syndrome. In comparison to similar reports of 8p deletion and inverted duplication syndrome, the uniqueness of this report lies in the fact that the congenital heart defect occurred without the GATA4 gene involvement, and the nervous system involvement was more extensive. The patient's consent was obtained for the study.